Pair your Suunto Ambit2 with optional Suunto PODs (Bike POD, Power POD, heart rate belt, Foot POD or Cadence POD) and ANT+ PODs to receive additional speed, distance, power and cadence information during exercise. Visit www.thisisant.com/directory for a list of compatible ANT+ products. If you pair more PODs, Suunto Ambit2 remembers the latest paired POD of each POD type. 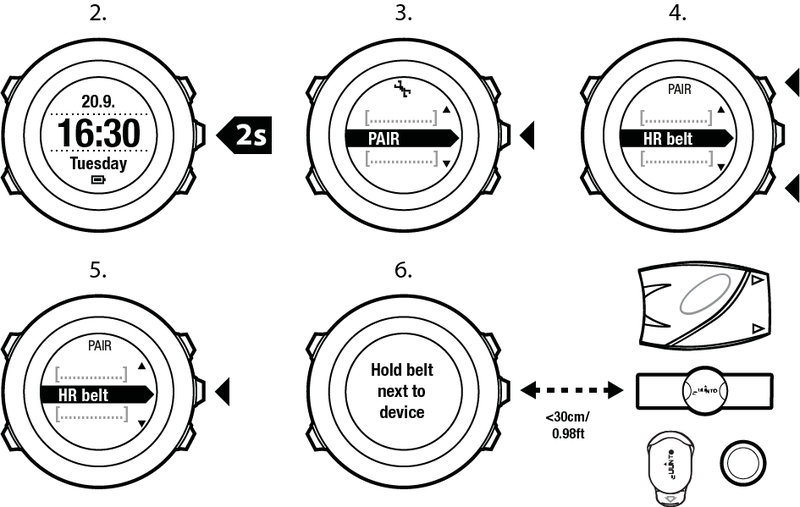 The heart rate belt and/or POD included in your Suunto Ambit2 package are already paired. Pairing is required only if you want to use a new heart rate belt or a POD with the device. Bike POD: rotate the tire with the installed Bike POD. Power POD: rotate the crank or tire with the installed Power POD. Heart rate belt: moisten the contact areas and put on the belt. Cadence POD: rotate the bike pedal with the installed Cadence POD. Foot POD: tilt Foot POD 90 degrees. Scroll to Pair with Light Lock and enter with Next. Scroll the accessory options Bike POD, Power POD, HR belt, Foot POD and Cadence POD with Start Stop and Light Lock. Press Next to select a POD or heart rate belt and start pairing. Hold your Suunto Ambit2 close to the POD/belt (<30 cm) and wait for the device to notify that the POD/belt has been paired. If the pairing fails, press Start Stop to retry, or Light Lock to return to the pairing setting. You can pair different types of power PODs with your Suunto Ambit2. For more information, see the power POD user guide. You can also activate the heart rate belt by moistening and pressing both electrode contact areas. Check that the strap is connected to the module. Check that the electrode contact areas of the heart rate belt are moist. For more information on pairing PODs, see the POD user guide.